I'm designing a shaft for a turbine and I need to know the stresses it will feel as the rotor assembly rests and accelerates on it. As shown here, it's supported by two bearings on each end and the hub in the center will connect to rotor blades that will turn as air moves through a wind tunnel. The end goal is to maybe hollow out the 1-3/8" shaft to minimize weight, but we need a stress analysis. Here's a picture of the bare shaft in Pro/E. I can see grooves for snap rings. I tried running a test in Pro/E's Mechanica, but encountered an error that I couldn't figure out (something about edges), so I moved to solidworks. Here's what I did. 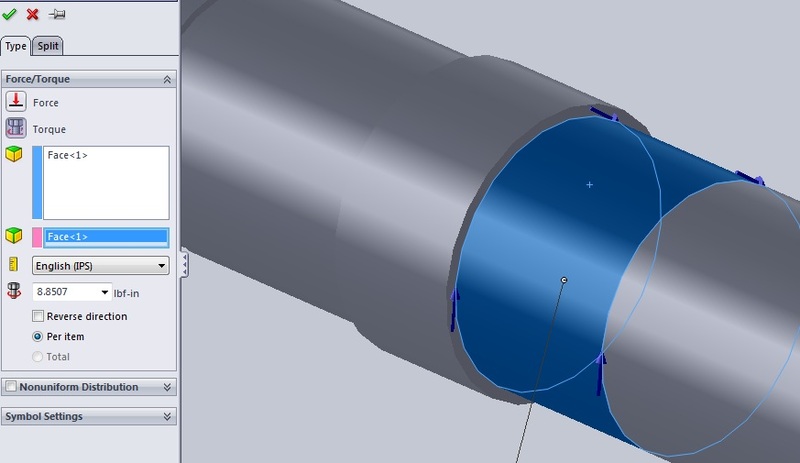 First, I chose material (Al 6061) and applied constraints in the snap ring grooves because specifying the bearing locations proved difficult and I just wanted to see if I could get any analysis done first. I chose a "hinged" constraint because I want the shaft to only rotate about its axis. I applied this constraint (shown) at all four snap ring grooves. I then applied a torsional load around the middle of the shaft where the hub would be connected. I also applied a weight force for the weight of the rotor assembly here. 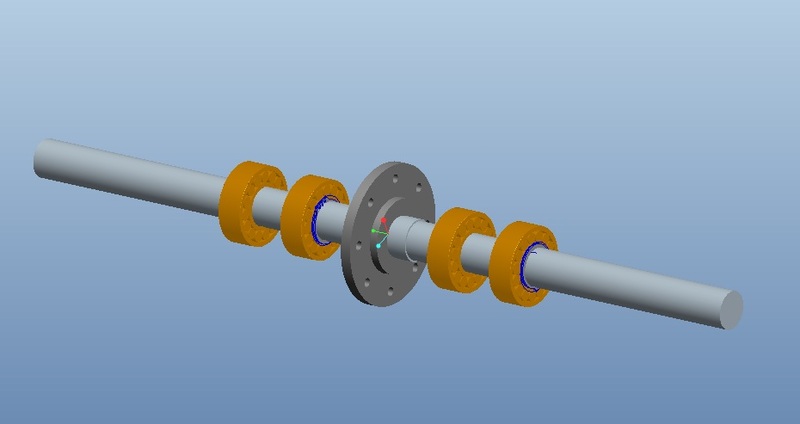 So in the end, here's what the shaft with simulation specifications looks like. Then I mesh and run it. 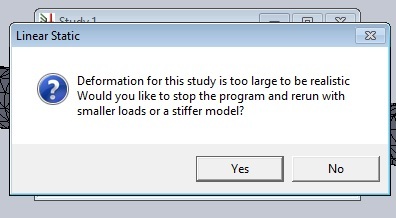 I get 27.3% into the analysis before an error pops up saying "Deformation for this study is too large to be realistic..." (shown here). Choosing to stop cancels the analysis and I don't know what to do. Choosing to continue makes the simulation run for a while. Yesterday, it finally ended and gave me an error about strain being > 25%, which is obviously not good. Today, it's been running for 22 minutes and nothing has happened. Weird. EDIT: I just noticed the window. It popped up underneath something. Here it is. The study terminates when I click okay. So what am I doing wrong? What am I missing and what do I need to change. I'm open to all suggestions. Thanks a lot. sounds like you do not have it adquately restrained. You need to turn on inertial relief. See attached. The torque is making the shaft rotate. Else fully constrain the shaft. Now can some Maths expert explain Inertial relief? He cross posted to eng-tips. The answer is here. To remove rotation, setup an axis along the axis of the shaft and prescribe a tangential constraint. You have nothing reacting the torque load (hence the large strain). What you really need to do is constrain the rotation at one end (i.e. the appropriate face the load transfers through) and apply a torque at the other end equal to that requirted to accelerate the turbine. Without doing this you won't get the correct stress result you're after.